Adams County Correctional Center is a minimum security prison located in Natchez Mississippi. The facility is run by the Corrections Corporation of America through a contract granted by the Federal Bureau of Prisons. Adams County Correctional Center has a maximum capacity of 2,443 inmates and specializes in housing illegal immigrants who have been charged with serious crimes or who have been deported and have illegally re-entered the United States. Adams County Correctional Center is comprised of six housing units. 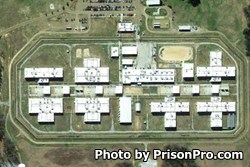 Each housing unit is further divided into three pods which contain about 135-145 inmates in each. Offenders at Adams County Correctional Institution are house in pods with bunks. In 2012, a riot broke out at Adams County Correctional Center. During the riot 25 staff members were held hostage. When the disturbance was over one correctional officer was dead and sixteen staff members injured. The riot was reportedly the result of poor medical care and substandard food conditions. All visitors must be on the inmate's approved visitation list prior to attending a visitation session. Visits at Adams County Correctional Center are held on Saturdays, Sundays, and Federally recognized Holidays from 8am to 3pm. A maximum of three adult visitors per visit (children do not count towards this number but visitors must be able to control the number of children they bring with them). Visiting sessions are only limited by the number of visitors who are present at visitation, if the visiting room is not crowded visits can last the entire session, however on busy visiting days visits may be only an hour or two.